High Peaks Pure Earth has translated a blogpost written by Woeser on November 21, 2012 and posted on her blog on the same day. This blogpost is a follow up to Woeser’s blogpost of November 9, 2012, titled “Why Was Ngapo Jigme, Director of Radio Free Asia’s Tibetan Service, Suddenly Dismissed?”. 1. Mr. Ngapo Jigme was dismissed by USA’s Radio Free Asia and not by the Central Tibetan Administration, therefore, in my opinion, in relation to this incident, Rep. Rohrabacher has to direct the responsibility of investigation towards Radio Free Asia’s management, not towards exile Tibetan society. 2. I think that individuals as well as organisations have the right to like or dislike a media, this opinion can be expressed; if this is merely an opinion, this is not overstepping any boundaries. 3. What is important is media independence, external matters or attitudes should not have any bearing on personnel matters or moreover the content of the news, this would be stifling the freedom of the press. Even if Radio Free Asia is motivated by its sympathy to the Tibetan cause, it cannot violate the basic principles of the democratic freedom of the press. That kind of activity would actually be harmful to the Tibetan cause. 4. For more than half a century, the Tibetan exile government has made tremendous contributions that is clear for all to see, Rep. Rohrabacher’s criticism of Radio Free Asia’s dismissal of Mr. Ngapo Jigme should not turn into sweeping generalisations. 5. 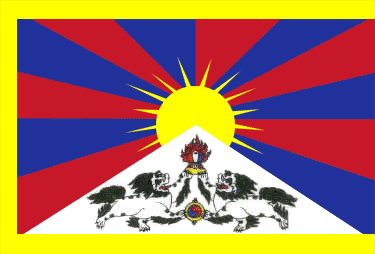 I believe that Tibetan exile society needs to raise the level of its own political modernisation. This kind of modernisation is not just the appearance of democracy only on the surface but a real understanding of and compliance with the ideas and principles of democracy, especially to accommodate a variety of views, receive criticism, as well as to monitor those who are in control, these things are the true essence of democracy. 6. 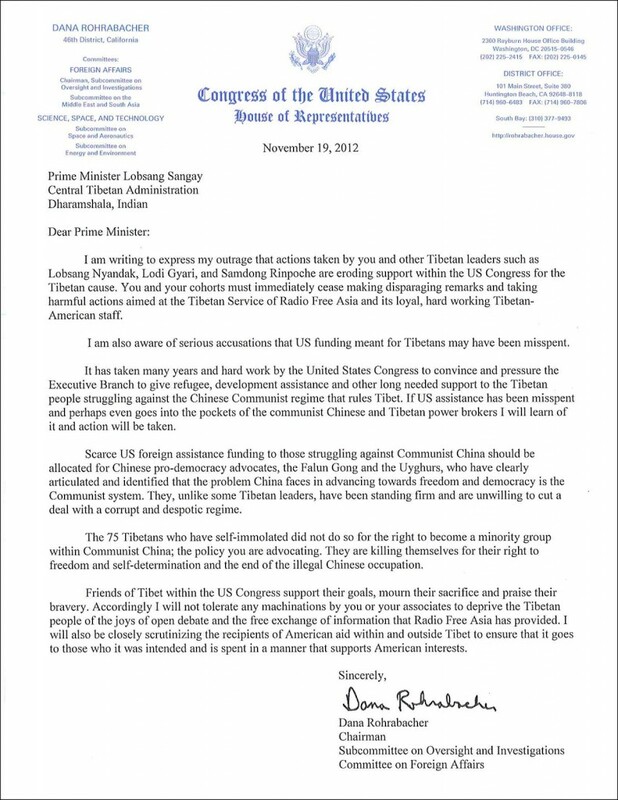 I am grateful to Rep. Rohrabacher for his attention to the Tibet issue, at the same time I hope that Rep. Rohrabacher will withdraw criticism directed toward Tibetan exile leaders, and instead direct it towards Radio Free Asia. How could you so forcefully defend Mr. Ngapo Jigme when the facts about his dismissal is not very clear as yet. Mr. Ngapo with his excellent knowledge of Chinese, Tibetan & English is certainly an invaluable asset for our country. But what is most troubling to me & perhaps to many other Tibetans like me is his reported easy access & frequent visits to China when every one knows how difficult it is for Tibetans outside to obtain visa to visit Tibet or even China. Unless his visits are in acquiescence of the Tibetan Administration, it certainly raises serious troubling questions about his loyalty …..